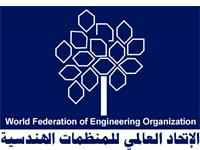 World Federation of Engineering Organizations (WFEO) is a non governmental international organization that brings together national engineering organizations over 90 nations and represents some 15 millions engineers from around the world. WFEO is the world wide leader of the engineering profession and cooperates with national and other international professional institutions in developing and applying engineering to the benefit of humanity. The World Federation of Engineering Organization (WFEO) is committed to the advancement of the world engineering profession for the benefits of mankind. It particularly works to assist development of the engineering profession, and in the sharing, exchange and transfer of technology from one country to another. It works to improve the community understanding of engineering, the quality of engineering education and training, and the ethics and standards of engineering practice. The engineering profession around the world, whose national and international institutions are the members of WFEO, face a period of rapid and substantial change. Engineering has been an international profession for at least a century. However, in this era of globalization, engineering is becoming even more global, and global engineering practice will become more important. There are increased needs to harmonize global standards. The WFEO International Members and WFEO, in conjunction with the European Community, APEC, and ASEAN have been working hard for many years with some success to institute the recognition for Regional Professional Engineers like the EuroEng. APEC-Eng. and ASEAN-Eng.. In this important initiative for professional mobility, engineers are way head of any other profession. WFEO is currently working towards world mobility for professional engineers. In this connection, the World Trade Organization has an important role to play. As population and economic growth place increasing pressure on our social and biophysical environment, engineers must accept increased responsibilities to develop sustainable solutions to meet community needs, overcome extreme poverty and prevent segregation of people. The education of engineers needs to inculcate an understanding of sustainability and cultural and social sensitivities as well. The engineering code of ethics must reflect a strong commitment to principles of sustainable development. There are special needs of the developing countries. The developed world can assist in the training of local engineers, in the generation of work opportunities for them in their own countries, and in the sharing of appropriate technologies. The developed world also needs new, efficient and cleaner technologies that do not adversely affect the environment and will help to cut down on their excessive consumption of the resources of the world. Developing countries have also accumulated over decade's valuable lessons and experiences in appropriate technologies that can be shared with one another. Without their local and regional efforts, it will be very difficult to achieve a sustainable world. WFEO will encourage all its international and national members to contribute to global effort to establish a sustainable, equitable and peaceful world. - To provide information and leadership to the engineering profession on issues of concern to the public or the profession. - To serve society and to be recognized, by national and international organizations and the public, as a respected and valuable source of advice and guidance on the policies, interests and concerns that relate engineering and technology to the human and natural environment. - To make information on engineering available to the countries of the world and to facilitate communication between its member nations. - To facilitate relationships between governments, business and people by contributing engineering dimension to discussions on policies and investment. - Develop through appropriate engineering activities and education, a worldwide understanding and commitment to sustainable development. - Pursue those programs and activities within Agenda 21 of the UNCED World Summit that are applicable to engineering. - Foster and encourage the formation and strengthening of national and international associations of engineers. - Promote societal benefits through cooperation among engineering organizations around the world, and with institutions of science and industry, universities, and other organizations. - Disseminate engineering information and promote global access to this information. - Foster the transfer, sharing and assessment of technology. - Discuss and propose program to improve the quality of engineering education and training, and provide assistance for the establishment in all member nations of procedures for the accreditation of engineering courses. - Develop guidelines to facilitate free trade in engineering services, and regional and international recognition of engineering qualifications. - Provide for the protection, security and health of the public by the assessment and dissemination of technologies for the control of risk and the prevention and reduction of damages due to man-made and natural disasters. - Sponsor congresses and other technical meetings of significance to the profession, and disseminate their conclusions and recommendations.